From November 14-17, 2018, the Cox Foundation welcomed 27 students from Historically Black Colleges and Universities and Hispanic Serving Institutions to Washington, D.C. for a fully funded, three-day professional exploration program to learn about careers and opportunities at the U.S. Department of State. Over the course of the three days, the students met with distinguished ambassadors; participated in diplomatic simulations alongside the US Diplomacy Center; spoke one-on-one with current FSOs and Pickering and Rangel Fellows; met with representatives from foreign service officers outside the generalist track, such as Diplomatic Security and the Foreign Commercial Service; and toured other government agencies and international facing institutions. 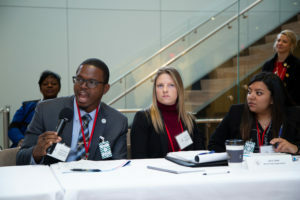 The Cox-State Department Diplomacy Seminar was collaboration between the U.S. Department of State, the Una Chapman Cox Foundation, and the Close-Up Foundation. Look out for the 2019 Seminar this October! For more information on other opportunities at the U.S. Department of State, visit careers.state.gov. In early 2017, the Cox Foundation completed a new project to study the role of key U.S. colleges and universities, including Historically Black Colleges and Universities (HBCUs) and Hispanic Association of Colleges and Universities (HACUs), on how best to prepare students for careers in the U.S. Foreign Service. The project will support the Foreign Service in reaching a wider audience of qualified students and improve recruitment rates. This To the Contrary e pisode explore the steps the State Department is taking to remake the Foreign Service into an institution that looks like America. It debuted on PBS in November 2014, and continues in syndication. Contact us to request a DVD of the episode. 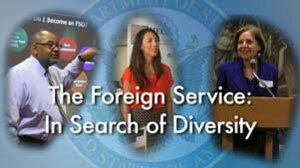 Foreign Service Officers are the face of America around the world. At a time in the not so distant past, FSOs were almost always white, middle to upper class and from the Northeast. Today, there are more women and minorities, but they are underrepresented. The State Department is working to remake the institution into one that looks like America today; diverse and multi-cultural. The Cox Foundation has long supported internships with the Department of State as a recruitment tool. The Distinguished Interns program placed Foreign Service Officers as Diplomats in Residence at various universities and select promising Foreign Service candidates for an internship program preparatory to taking the Foreign Service entry examinations. This year, the Foundation will support the Department of State in reviewing and assessing the Unpaid Student Internship program to enhance talent acquisition and diversity recruitment. The Cox Foundation supports the Association for Diplomatic Studies and Training’s oral history program. Every year, hundreds of foreign affairs professionals from the Department of State, the Agency for International Development, and Commerce, retire and often their experiences are never preserved for current or future generations and their perspectives are lost forever. ADST conducts oral histories with these professionals, to deepen general knowledge of international affairs and bring nongovernmental expertise to bear on major international peace and security issues. The oral histories are made available to the public through the Library of Congress and on ADST’s website. ADST’s Cox Fellow for Oral History selects interviewees, subjects and geographic areas in consultation with Cox Foundation staff. In 2016, ADST undertook an oral history of the Cox Foundation, interviewing trustees, members of the Policy Council, and Department of State officials on the Foundation’s early history and accomplishments over its 37-year history.